D/JX 215997 Ordinary Seaman. H.M.S. Drake. Royal Navy. Date of death 21 April 1941 aged 29. Buried in Plymouth (Weston Mill) Cemetery. 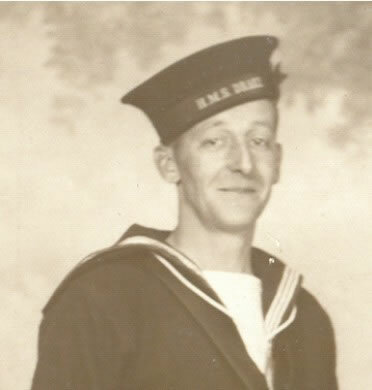 Anthony Flower was born in 1911, the son of Capt. Leopold (d.1916) & Helen Gladys Flower (nee Sutton). Mrs Flower then remarried in 1926 and became Mrs Roger Twitchell. Montague being the second son of the first marriage born in 1914. Anthony Flower met Margaret Mary Moon at a railway station canteen where she was on duty with the WRVS. After a whirlwind romance they were married on the 28th March 1941 at the Parish Church in Pinner. Anthony was at based at HMS Drake (the Devonport naval barracks) Plymouth. On the night of 21 April 1941 the others of his group went to the cinema. Tony probably stayed behind because he had an exam for a commission the next day. That night Plymouth suffered a major German air raid that claimed 750 lives, of these 113 were killed at the barracks, among them Anthony Flower. The men who visited the cinema survived. Margaret Flower subsequently joined the WRNS. The 1945 Leigh Service Register shows Park House as her home address.